Eastleigh manager Ian Baird has earned himself the nickname ‘Roberto’ from the man who will occupy the Sutton United dugout at the Silverlake Stadium tomorrow. But despite ex-Spitfires boss Paul Doswell jokingly likening him to Manchester City’s big-spending Italian boss Roberto Mancini, Baird has no immediate plans to dive back into the transfer market. Since the arrival of Bridle Insurance as majority shareholders and main sponsors, the Spitfires have bucked the downward economic trend by splashing the cash on their playing squad with the long-term goal of achieving Football League status. But having secured the signatures of Eastbourne Borough defender Gary Elphick and Boreham Wood midfielder Daryl McMahon in the last seven days, Baird feels it’s time to call a halt on the spending and concentrate on moulding his new-found wealth of talent into a winning team. “As far as I’m concerned we don’t need any more signings for the moment,” said Baird. “We’ve got to put the brakes on and go with what we’ve got. After stepping down as Eastleigh team manager in 2006, Doswell had a spell working alongside Baird, who took over the reins from fellow ex-Saint David Hughes in October 2007. The three met up for a coffee yesterday but, according to Baird, the only thing they talked about ahead of tomorrow’s big game was the state of the Silverlake surface. “The pitch cut up badly against Salisbury on Tuesday, but you can’t blame the groundsman, it’s just the way it is after all that rain,” he said. “It made it difficult to get the ball down and pass it, but Daryl McMahon did very well on his debut. Although Sutton have drawn their last three league games, they are still in the play-off frame – 13 points clear of mid-table Eastleigh. “When we went up there we played very well (in a 2-0 defeat) and, by Dossie’s admission, we deserved to get a point,” said Baird. “It’s going to be another difficult game tomorrow. Sutton seem to have a certain resilience about them. “They’re a side who were very successful last year (coming up as Ryman champions) and they’ve kept that winning mentality. Eastleigh may well be boosted by the return of top scorer Jamie Slabber (cut leg), but Jordace Holder-Spooner (ankle) and Richard Gillespie (knee) are out and there are doubts about Jamie Brown (hip), Andy Forbes (groin) and Damian Scannell (groin). Young forward Andrew White has had his Eastleigh contract cancelled by mutual consent after his loan spell at Dorchester was terminated by the Dorset club. Spitfires midfielder Ian Herring has joined Chippenham Town on a month’s loan. And on a busy day for Baird, teenage full back Billy Tsovolos is returning to his native Australia to pursue a university career. 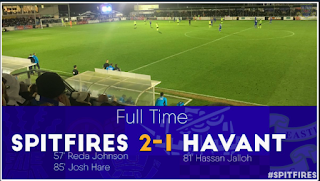 A stunning Josh Hare strike sealed a 2-1 win for the Spitfires on New Year's Day to defeat rivals Havant. Reda Johnson had headed Eastleigh in front. The visitors went on to equalise nine minutes from time before Hare's late winner settled the derby. 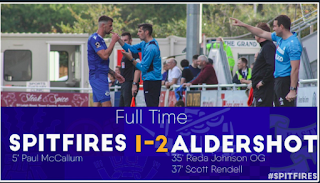 Paul McCallum gave the Spitfires an early lead but visitors Aldershot hit back with two goals to claim all three points at the Silverlake Stadium as Eastleigh's six game unbeaten run came to an end. 🗣 | "I think that first half really set the pattern for the game." Another late winner for Eastleigh. 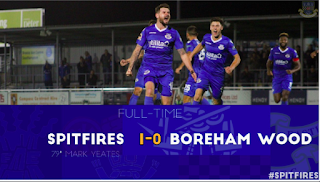 This time it was Mark Yeates on target for the Spitfires who claimed back-to-back victories. It was also a second clean sheet in as many games for goalkeeper Max Stryjek. 🎥 | "He's pulled off the best save I've probably ever seen live!" Could this be the best save of the season?